How can I contact another user, if that user has not specified any contact details in their profile? Instant messaging or private messaging is not available: requests to implement that have been declined to keep focus on questions and answers, and to keep those visible to everyone. Then, if you have at least 1,000 reputation, change the room parameters to Gallery mode. 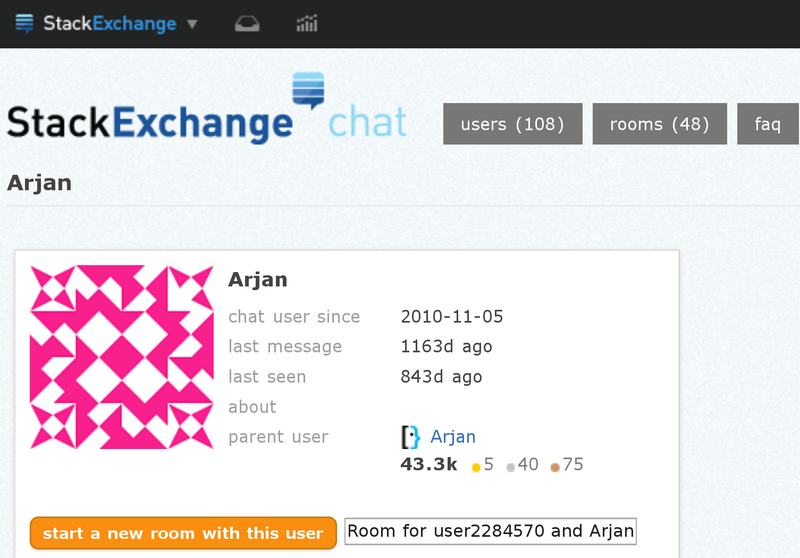 If the user has never logged on to Stack Exchange Chat but has a Stack Overflow profile, you might also try on Stack Overflow Chat. One might use comment replies to notify a user of a comment. But remember: even comments should be relevant to the post, and can be flagged as noise if they are not, so this is not recommended. In rare cases where immediate action is necessary (e.g., the user has accidentally left login credentials in a post), you can flag for moderator attention and explain what the urgent matter is about. On the flip side, if you want to provide a way for people to contact you, leave contact information in your user profile. You can still see the "About Me" section of users' profiles. Often, users place links to Twitter, Github, and their personal website. By checking out these links, you can often see email addresses. Also, many users place their emails and Linked In profile links in their publicly available "About Me" section, especially if they are interested in networking. I once found a way to contact another user in private. The procedure is simple. We exchanged out twitter accounts in a chat session and followed each other. Then using Twitter's private chat function, we managed to exchange more contact methods. It's really safe since if someone else followed your Twitter you can simply ignore him and send your message to the one you want to contact. rather I'd suggest to at least place a button in every users profiles: "Request contacts details". Clickable just once. Let me kindly explain and for my example, we said first that e.g. my stack* user name will be Robert_SE and I'm trying to contact user JhonDoe. I goto JhonDoe profile but unfortunately he did not filled the possible contacts and or they are wrong/expired. fill your social channels details and or contact details? profile link and you'll find his/her contacts details. for the simple fact that, after clicking it once, for me user Robert_SE, the button "Send contacts request" will be grayed disabled. EDIT from comments, it is needless to say, in my idea, the button will we shown ONLY to logged users. If you allow me, this could turn in a cool solution for this long term question. Not the answer you're looking for? Browse other questions tagged support faq communication . How do I contact a stack overflow user? Is there a way to contact another member of stack overflow? How do I chat with another user on StackOverflow? How can I get the email of a stackoverflow user? How to ping a user for chat? Where should I put a question for the author on stackoverflow? How to send Request to join room to particular user on Stack overflow? How do I contact another user? How can I send message to unique member?